Our aunt recently sent us the King Arthur Flour Baker’s Companion cookbook. When looking through it, these waffles stood out and we finally got around to making them! And they were not a disappointment. 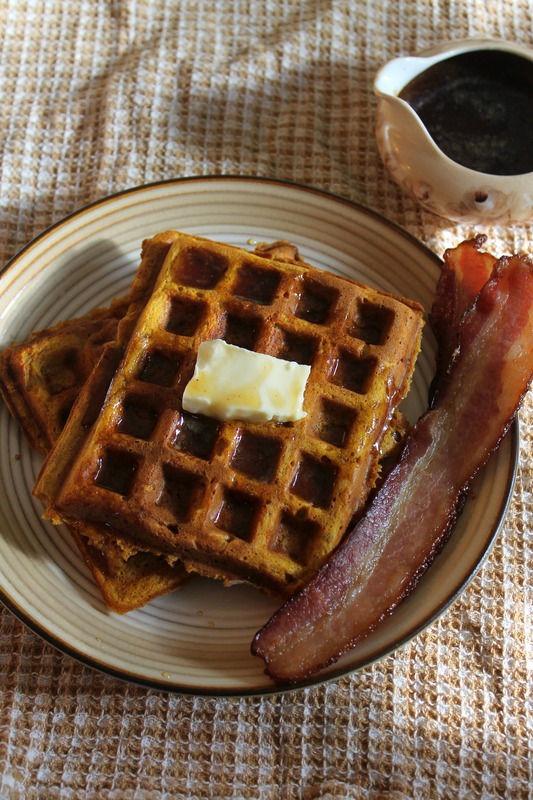 These pumpkin waffles, paired with warm cinnamon maple syrup, butter, and a couple of slices of bacon, are a wonderful breakfast treat! They are made with half whole wheat flour, to make them a little healthier, and the chopped pecans add texture and protein. Of course, pairing them with whipped cream would probably make them out of this world! Don’t skip on this recipe- these waffles are good ones! In a large bowl, combine flours, baking powder, baking soda, salt, and spices, stirring to mix. Stir in pumpkin, brown sugar, butter, and egg yolks. Add buttermilk and mix until thoroughly blended. In a large bowl, beat the egg whites until stiff. Fold the whites into the batter and gently stir in pecans. Scoop batter into a preheated waffle iron. Bake waffles until golden brown. Serve with butter and warm maple syrup. Enjoy! Side note: To make the cinnamon maple syrup, melt a little butter in a few tablespoons of real maple syrup and sprinkle with cinnamon. Stir to combine and serve warm over the waffles.